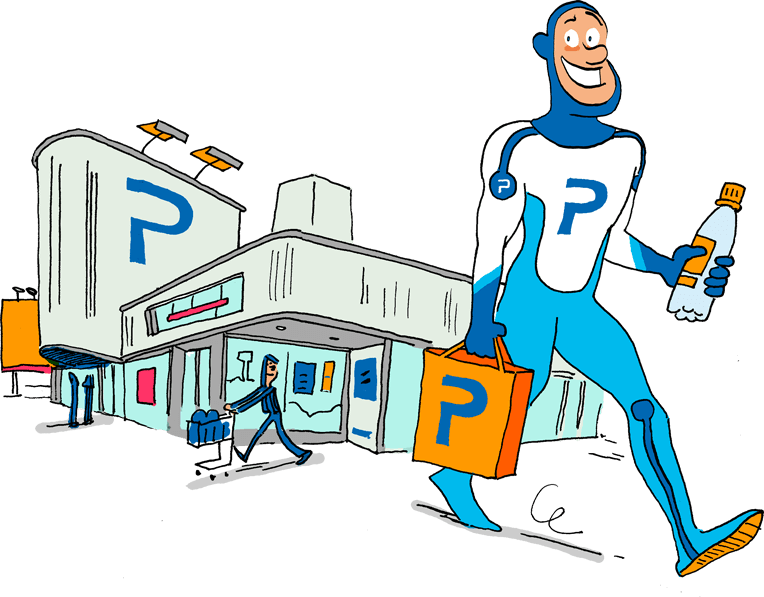 Plastics4health – Plastics protect our health and safely shape our modern lives : Come and see for yourself ! 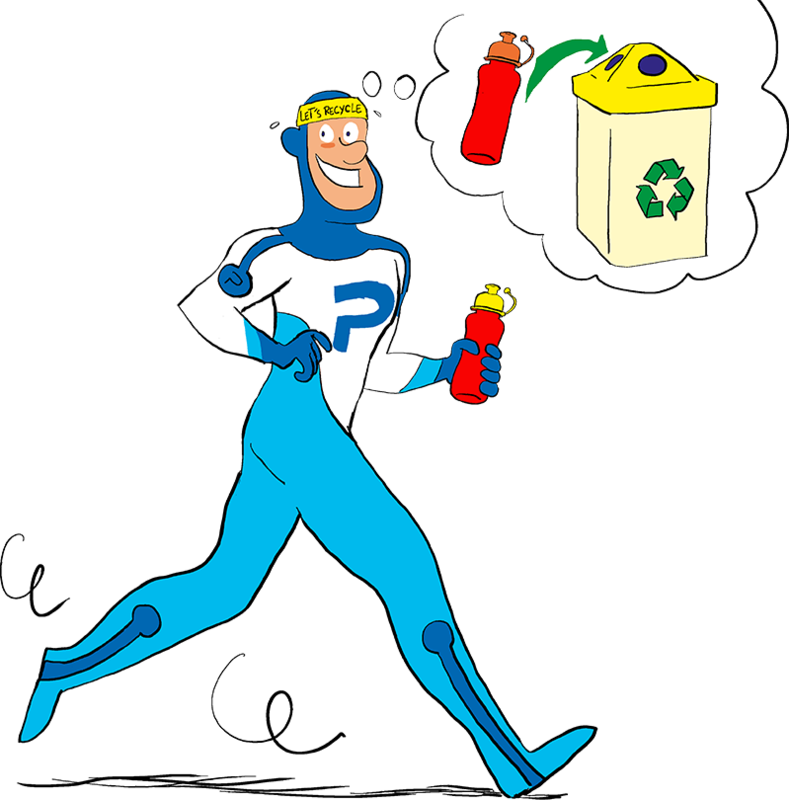 We tend to think that plastics are limited to single-use or disposable items like plastic bags, bottles and packaging. Actually, packaging only accounts for about 40% of all plastic products. What about the remaining 60% ? 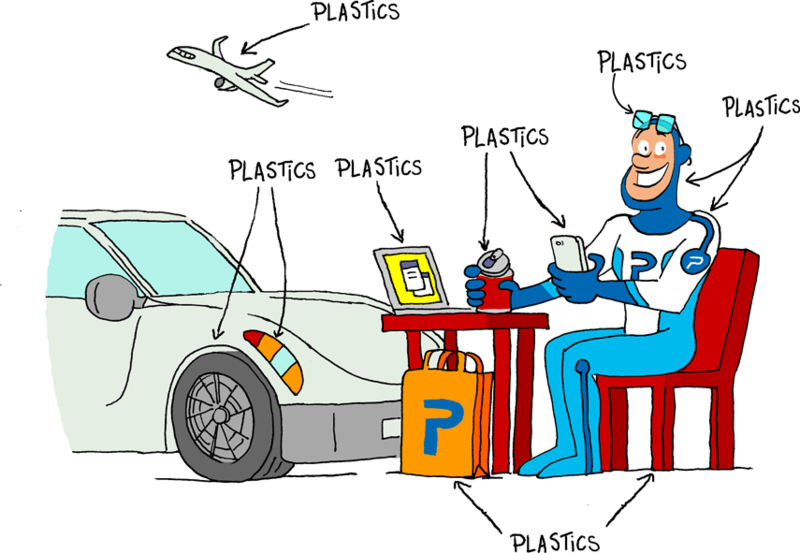 As products evolve, so do plastic materials, and many of them are still to come. 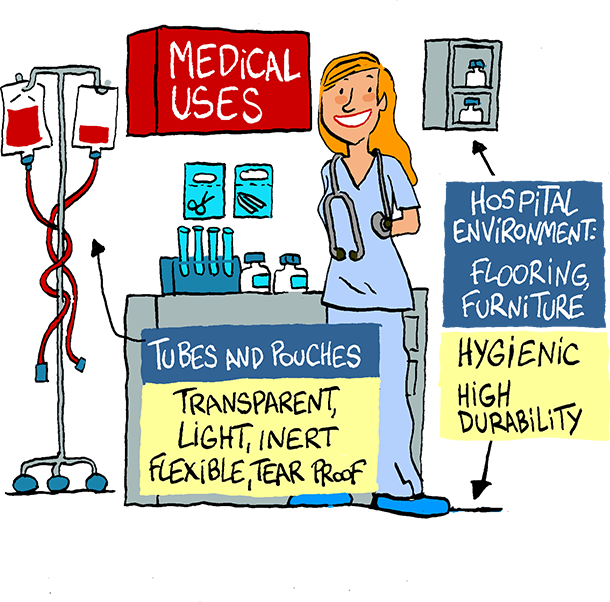 Plastics also protect the water we drink and the food we eat from contaminants, and are essential to medical and safety products, including incubators, defibrillators, smoke detectors, oxygen masks, helmets, ear plugs, air bags, safety belts and even speed bumps. Plastics are polymers, made out of monomers that are bound together using various chemical reactions and additives. 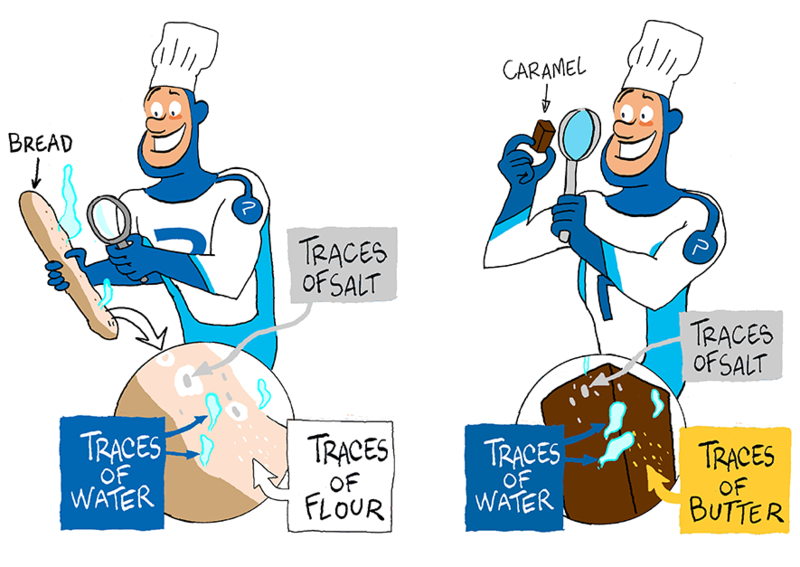 You combine different ingredients (monomers) and spices (additives), mix them together through all kinds of baking processes (chemical reactions) into a final dish (a plastic material). 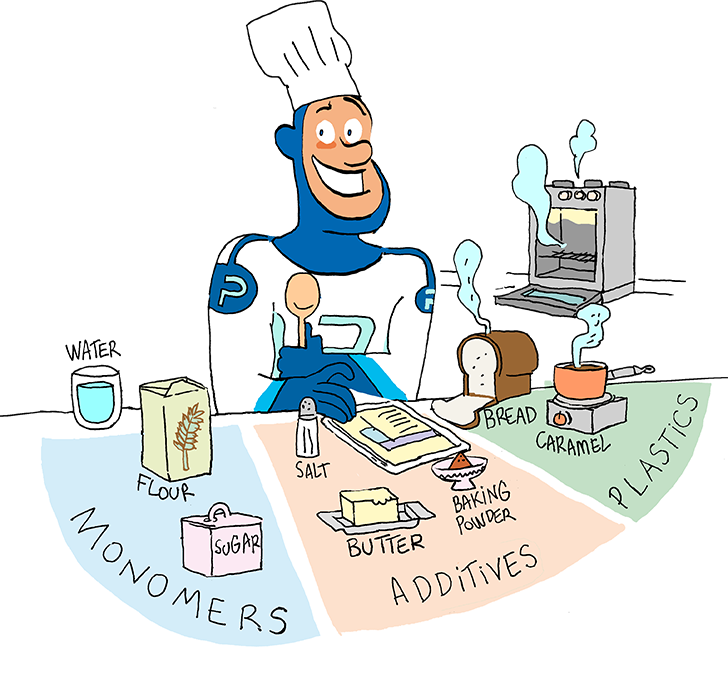 The resulting material (plastic) is a whole new product, completely different from its individual constituents: monomers and additives are assembled and « glued » together. 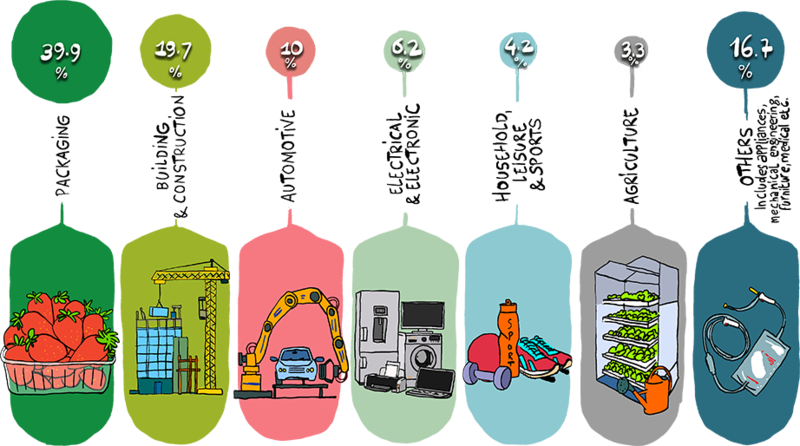 Many kinds of plastics can be obtained depending on the constituents and transformation processes used. You can check them out HERE. Like any other material on earth (e.g. wood, metal, paper…), plastics can release tiny traces of their trapped constituents: this phenomenon is known as migration. Today, concerns are raised among civil society about the potential health impacts resulting from exposure to chemicals, including constituents that can migrate from plastics. Exposure differs when typing on a plastic-coated smartphone or drinking a smoothie prepared in the plastic bowl of a blender. However, in both cases, consumers may only be exposed to tiny traces of plastic constituents. A typical driver’s reaction time is 1 second. 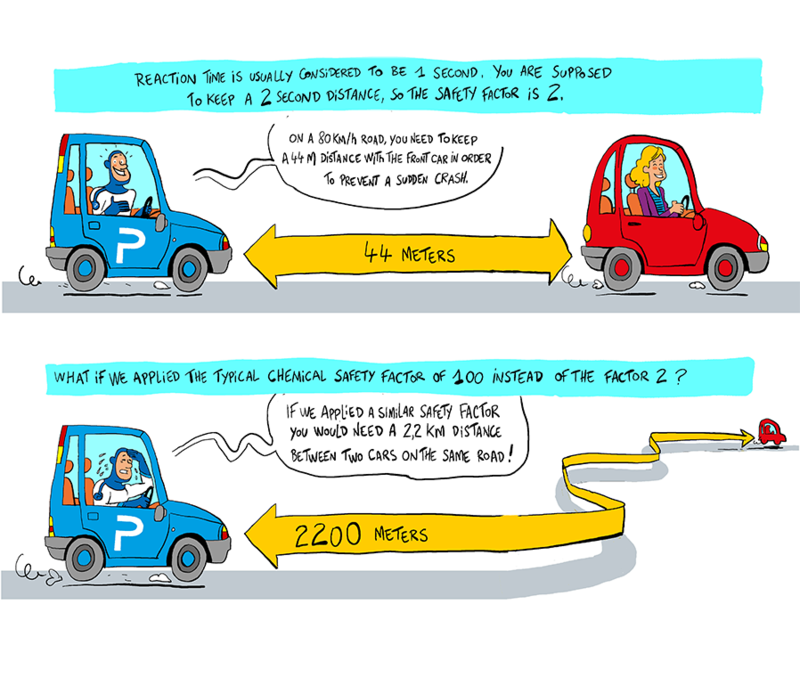 Therefore, French authorities impose a 2-second-distance between 2 cars is kept by drivers. Would a usual food contact regulatory safety factor be applied to traffic and road safety, drivers should keep a 100-second-distance between 2 cars ! 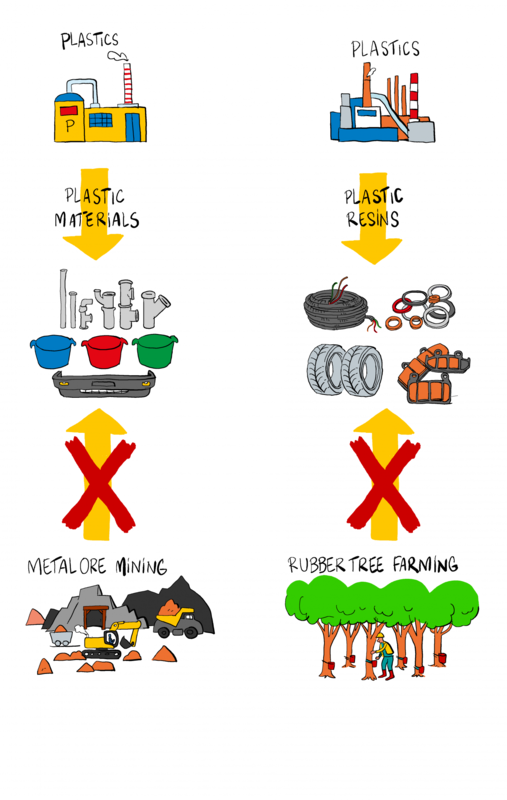 Before a consumer can actually use any plastic product, the latter has to go through many tests and regulations that producers must comply with. 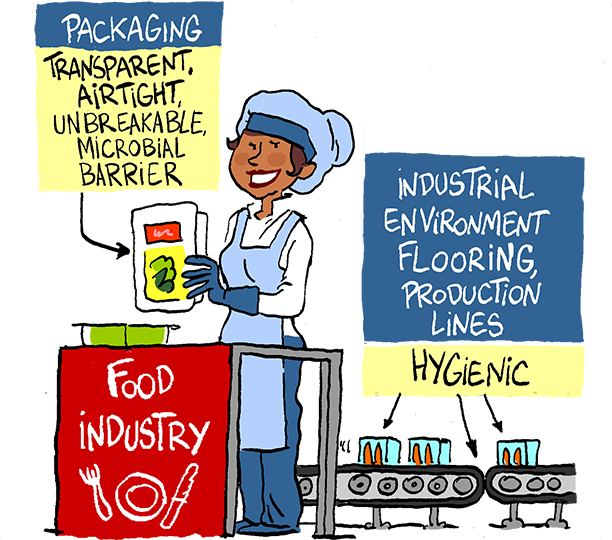 For example, when evaluating the safety of a food contact plastic material, authorities assess the toxicity of all its constituents, and then define for each of them an acceptable limit of migration, carefully set with significant safety factors. The allowed maximum exposure to each constituent can never exceed 1/100th of the tolerable daily intake ! The EU system was developed to ensure the safe use of chemicals and the products made out of them. 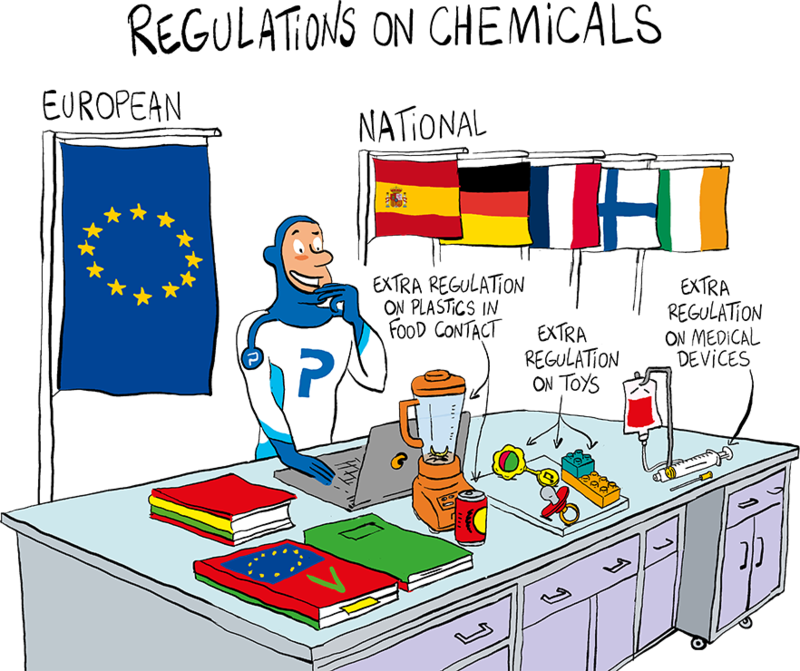 Monomers, additives and polymers are all regulated and evaluated by the European safety agencies, supported by their national counterparts. Besides the REACH regulation, which specifically addresses chemicals, many additional regulations apply to sensitive consumer applications: plastics in contact with food, used in toys or in medical devices, etc. These regulations define the conditions to be met – such as a Specific Migration Limit for every constituent – to ensure the safe use of the end products. Of course, these limits are updated whenever scientific knowledge warrants it. ECHA (European Chemicals Agency). Through the REACH regulation framework, industry is required to review all scientific data and generate risk assessments for all chemicals it puts on the market, including the monomers and additives used to make plastics. ECHA supports the implementation of REACH and evaluates the safety of chemicals. EFSA (European Food Safety Authority). 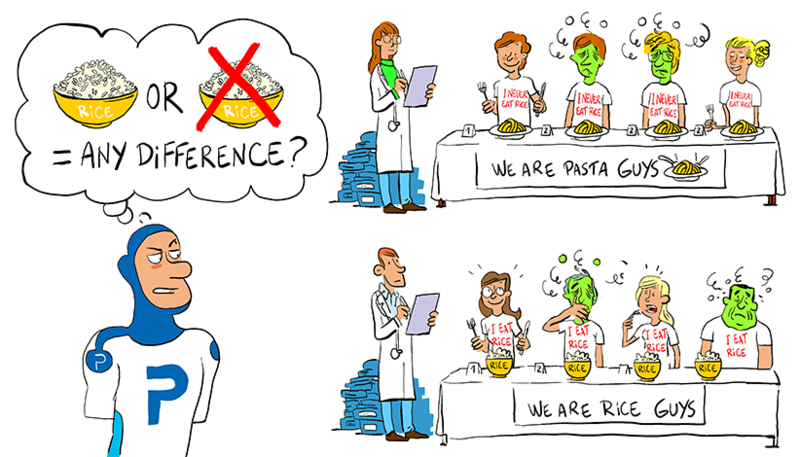 EFSA gives science-based opinions on the monomers and additives of plastics that come into contact with food, including packaging, kitchenware, food and drink containers. EU Commission SCHEER (Scientific Committee on Health, Environmental and Emerging Risks). SCHEER gives science-based opinions on monomers and additives of plastics that can be found in medical devices, instruments and premises. Exploratory study on cultured brain cells: injection of high-doses of pure arsenic, in order to evaluate the impact of a rice-based diet on neurodevelopment (rice naturally contains traces of arsenic). When it comes to better understanding the fate and the effects of a given chemical on the body, there are generally three kinds of scientific studies : Exploratory studies, regulatory studies, and epidemiological studies. Research on emerging questions that haven’t been studied yet, e.g. clarifying pathways (absorption, metabolism, excretion) or developing new predictive test methods. Their goal is not to determine if a product is safe under real life conditions, but to fill a knowledge gap in science. These are called EXPLORATORY STUDIES. Often, these experiments are conducted to highlight effects in specific situations which are not necessarily reflective of the actual conditions of use by humans. For example, isolated cells, tissues or animals, are exposed to various doses, for very long periods, or by direct intravenous injection, which never happens in real life. 04. 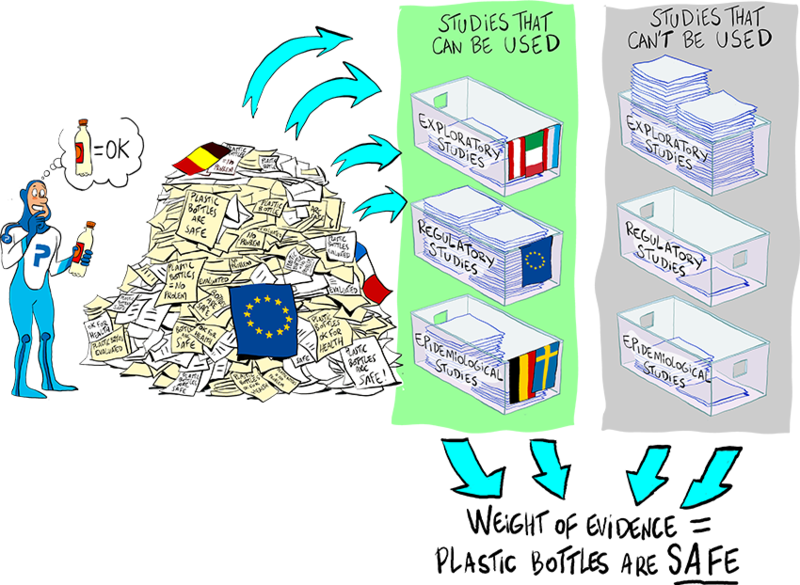 What studies are behind the regulations? 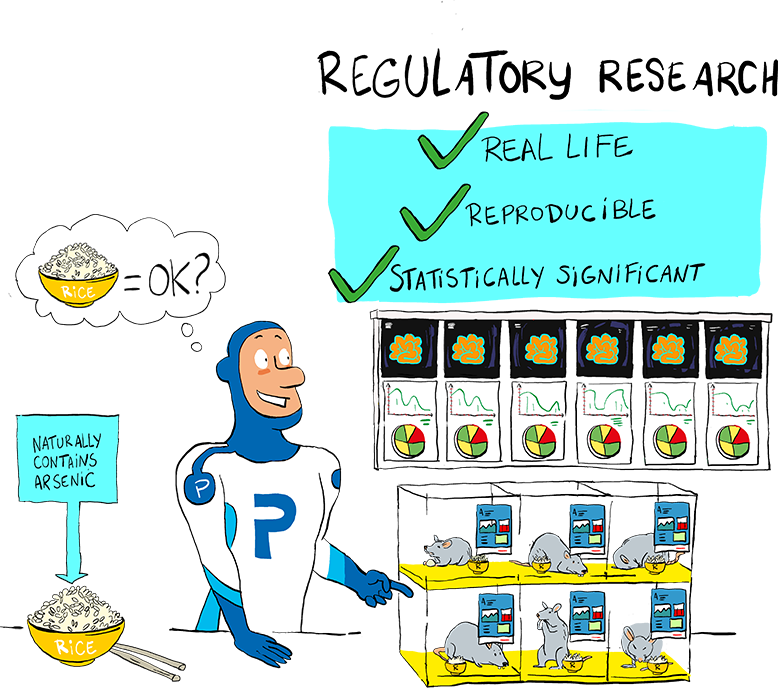 Regulatory study on 100 rats: controlled randomized trial in order to evaluate the impact of a rice-based diet on neurodevelopment (rice naturally contains traces of arsenic). On the other hand, there are studies designed to be used to evaluate intrinsic properties of the chemical and to assess under which conditions it may be used safely. For any chemical to be put on the market, these studies are mandatory for the industry to conduct. Their goal is to provide calibrated data to the authorities in order to determine if this substance can, or cannot, be safely put on the market. These are called REGULATORY STUDIES. Their design must be compliant with strict, robust, controlled, official* protocols of research. For example, this means gathering a sufficient amount of data (on multiple models, on numerous individuals and samples) in order to minimize the possibility of errors. They must be conducted in laboratories respecting official guidelines called Good Laboratory Practices. 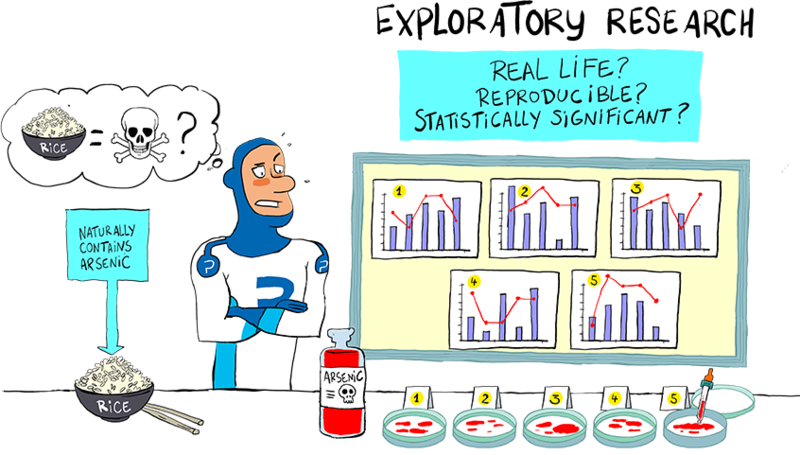 For example, this implies a highly controlled environment (hygiene, physical constraints, duration …), explicit statistical analysis of the data and documentation requirements, in order to be able to reproduce the experiment. Based on their review, a substance can be deemed safe, or authorities can require more tests to be performed. *: calibrated according to international independent scientific bodies (ex : OECD). Epidemiological study on 8000 people in order to evaluate the impact of a rice-based diet (rice naturally contains traces of arsenic) on neurodevelopment. Finally, there are studies that compare two groups of humans: one has been – or still is – exposed to a substance (“exposed” group), but not the other (“control” group). Over time, scientists gather data on these two groups (health status, exposure data, personal data, etc. ), and compare them to determine the health impact of being exposed to the substance. These are called EPIDEMIOLOGICAL STUDIES. For example: In Miami beach in summer, ice cream sales rise, and so does the rate of accidental drowning. The correlation between those events doesn’t necessarily mean there is an actual causation. In order to prove actual causation, you would need to understand the biological mechanisms through which A causes B (with exploratory studies, for example), and then confirm them with several regulatory-grade studies, including epidemiological research when relevant. 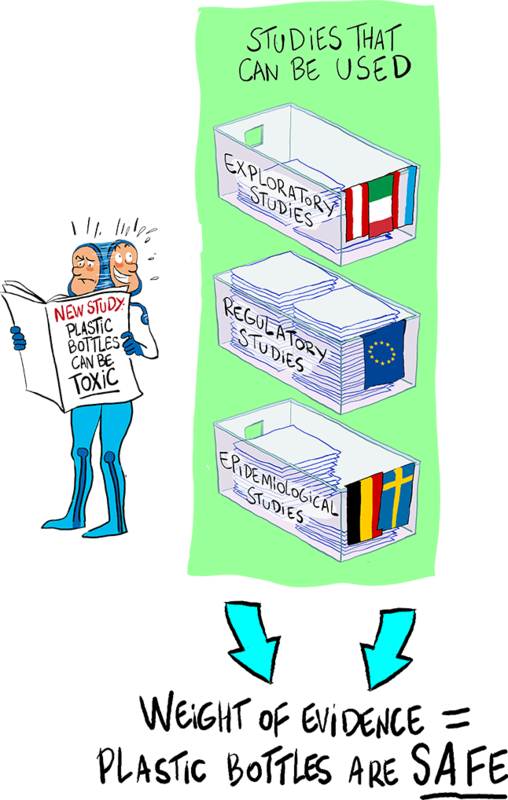 Evaluating the safety of a substance takes a lot of time and resources: European authorities base their opinions on the entire scientific data available up-to-date, sometimes among thousands of different epidemiological, exploratory and regulatory studies! This process is called the weight of evidence approach. 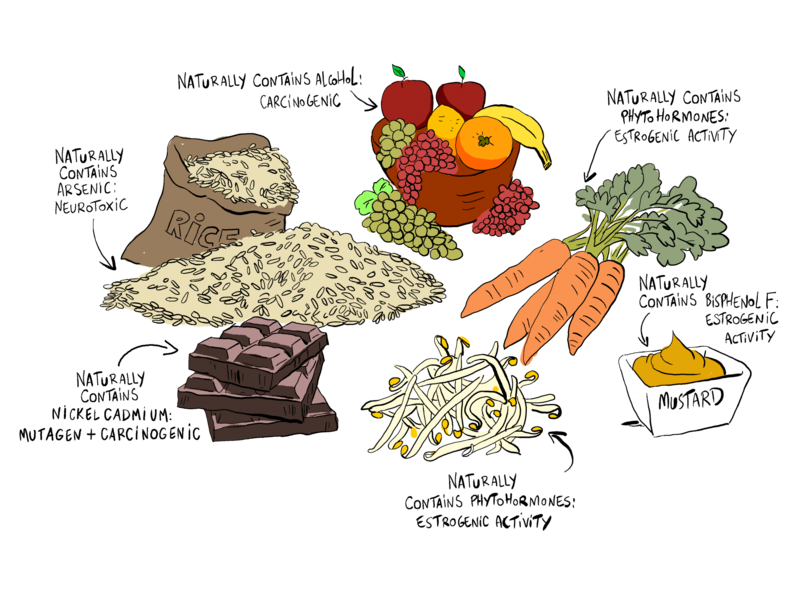 For specific uses, like food contact materials, if a substance is evaluated as safe, authorities may authorise it, under specific terms and conditions. That is until it is re-evaluated, taking into account the most recent data available. Not a day goes by without a press article, a TV show or a social network publication reporting on a new study questioning the safety of an officially approved product. A lot of news is based on single exploratory or epidemiological studies, without explaining the limitations of such specific works, nor putting their results into perspective with all other available data. Academic research teams tend to only publish studies showing effects. This phenomenon is called publication bias, and is linked to the process of research funding and allowance of grants. For example, observing effects on animals exposed to doses over 10000 times higher than real life exposure should not be considered as a direct proof of the existence of a risk for humans. Consumers wonder about the safety of chemicals in products because they mostly are confronted with articles drawing conclusions about single studies which do not reflect the entire scientific knowledge. There is an essential rule in science: a single recently-published study does not eclipse the weight of the already existing evidence. Detection devices for chemicals have become so powerful that they could virtually detect 1 single grain of corn in a 20 000km-long cargo train full of wheat ! Consumers realize they are exposed to chemicals, and often ask themselves if this may pose a risk to their health. Most concerns arise from the unprecedented ability of science to detect the presence of these substances in food, water, atmosphere, or in biological matrices such as hair, urine or blood. We are now able to detect even the tiniest quantities of almost everything. The fact that a substance is detected does not mean that an actual health concern exists. The hazard of a natural phenomenon, organism, event, chemical or product is its intrinsic capacity to harm the human body. A hazard becomes a risk only if we are exposed to it at a sufficient level. A lion represents a deadly hazard, but there is no risk if it is in a cage. In the case of a chemical substance, it is therefore crucial to understand its potential effects on our body -the hazard- and at what level of exposure this hazard becomes a significant risk. The risk is the probability of any hazard to actually cause adverse effects in real life conditions. The periods in our lives when we are more vulnerable to such hazard (pregnancy, foetal life, old age). 02. Hazard, risk, what is the difference? Neurotoxic = Can damage the structure or functions of the nervous system. Although life always bears elements of risk, the zero-risk approach has become increasingly popular, leading policy makers in Europe to adopt more regulations on chemicals (including for plastic materials) based only on the hazard properties of those substances, out of “precaution”. By stretching the precautionary principle, everything could be considered as potentially harmful, be it man-made or natural. Busses are definitely useful: effortlessly and in no time they can carry a lot of people from one point to another, with a much lower environmental impact than individual vehicles. 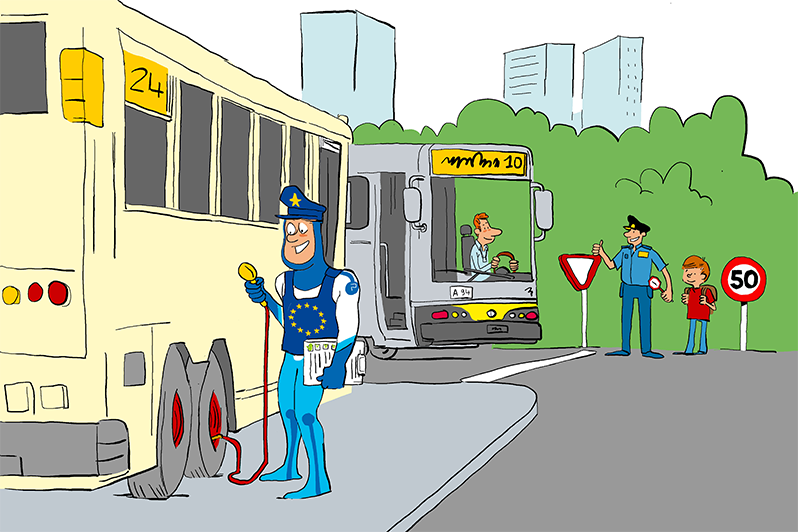 But accidents with busses involve around 30 000 people every year in Europe (Source : European Commission Statistics, 2015 data). So should all busses be banned ? → No. We need risk management, in the form of vehicle safety and traffic enforcement, as well as speed limits. Everything can represent a hazard. However, there is no need to deprive ourselves of highly useful products in the name of “precaution”. Originally the precautionary principle was meant to be a principle of action to be used by policymakers to require more information in order to clarify uncertainty. However, there is currently a growing tendency to resort to precaution only to call for restrictions or bans. Our society has created safety barriers – regulations – to protect us and guarantee that the risks that we are exposed to are under control and no cause for concern: we all rely on a risk-based approach. We, as a society, need the same risk-based approach for plastic products. Their constituents are trapped in the plastic matrix and only tiny traces of some chemical constituents can migrate from the end products. Because this migration is strictly regulated for sensitive applications, the associated potential health risks, if any, are marginal and well under control. Ignoring which performance is lost when replacing chemicals. Especially when less scientific knowledge is available on alternative chemicals, that often cannot fully match the set of performances of the original ones. Determining if this exposure is acceptable from a public health perspective. Adopting specific measures to ensure the safe use of substances in intended conditions, e.g. setting specific migration limits in sensitive applications, such as food packaging, medical devices and toys..
Metal: Plastic materials are now used in the production of safe, robust, yet lighter containers, including buckets, vehicle parts, pipes, etc. Latex: Resin-based materials have now replaced natural rubber in electrical insulation, tires, water pipe seals, brake pads, etc. Silk, cotton and wool: Nylon TM replaced silk in WWII, allowing for the industrial production of parachutes. Nowadays, all kinds of plastic fibers allow for more affordable and technical clothes. 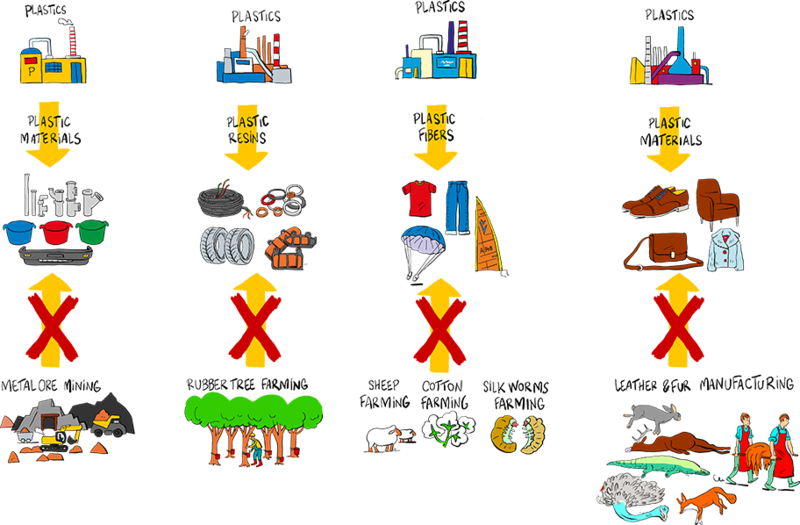 Leather and furs: Plastic materials and fibers are used in textile industries to produce synthetic leather and fake fur, preventing impacts on wild life and energy expenditures resulting from animal breeding. The very origin of plastics industries was motivated by the need to find alternatives to natural resources so to preserve them. Today, plastics aren’t just one material, but a large family of materials, each designed to meet specific needs. When looking for a material with a specific set of properties, plastics often turn out to be the most sustainable option. 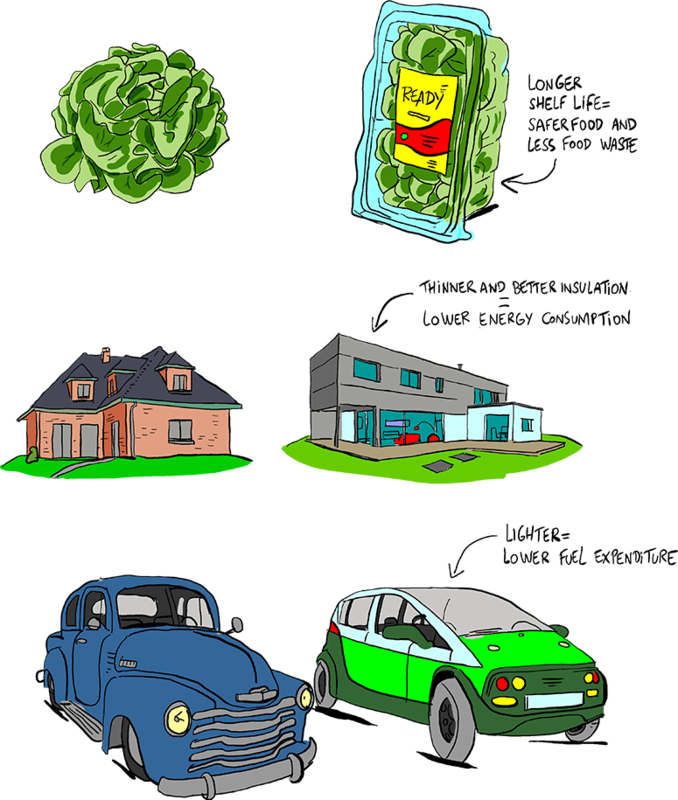 For example, 40% of all plastic materials in Europe are used in food packaging. 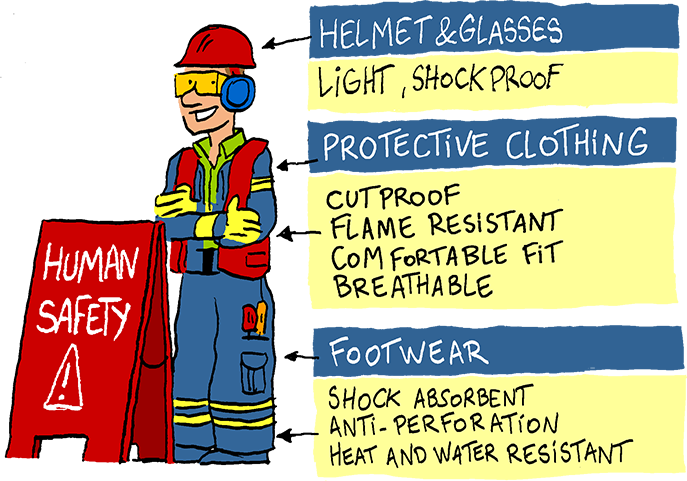 This is because these materials are light, shock resistant, hermetic and inert. 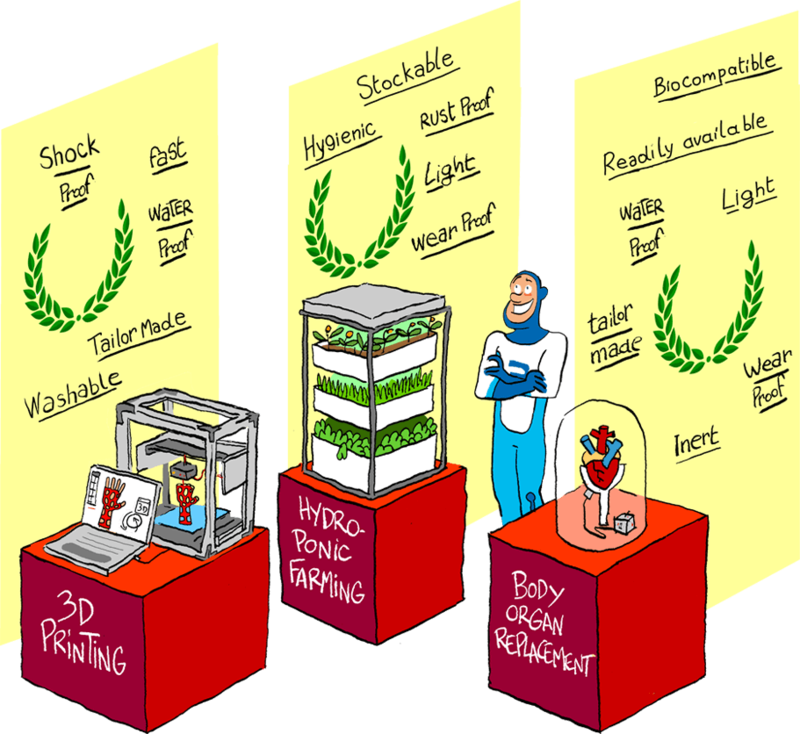 While being both easier and more energy efficient to transport than other materials (glass, terracotta, metals, etc.) they preserve food from external contaminants and prevent its early decay. 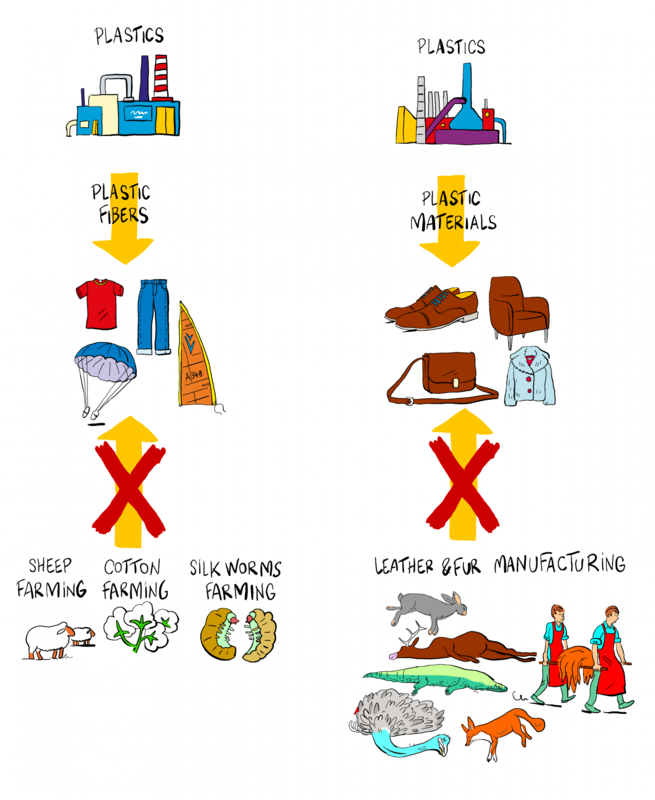 Over the past 50 years, plastics have enabled major breakthroughs in terms of consumer safety, prevention of food waste and overall resource efficiency of the food chain (see how HERE). 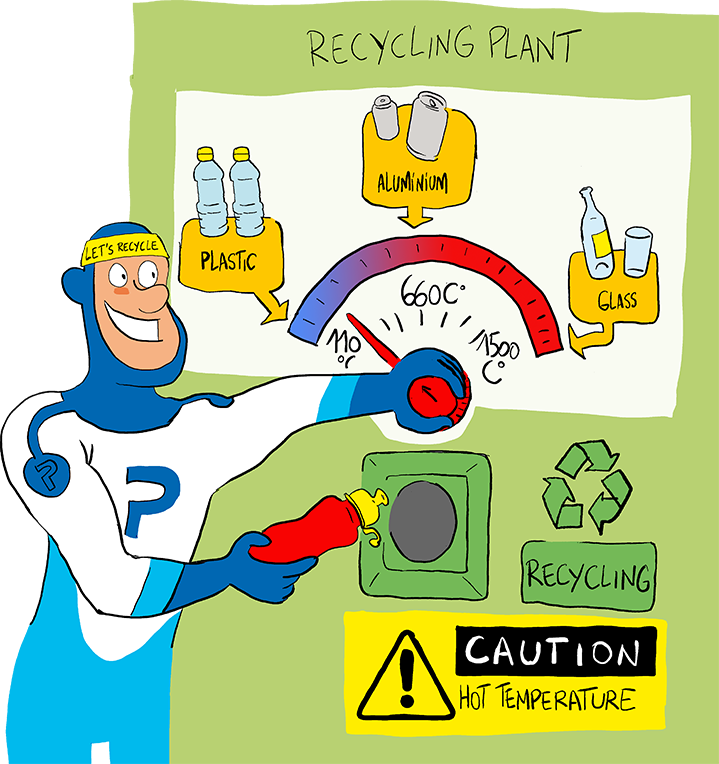 Plastics also revolutionized building and transportation materials, replacing wood, metals and stone with safe, robust, yet much lighter, heat retaining and flexible (less breakable) materials, thus drastically decreasing overall energy expenditures and green gas emissions during their use phase. All in all, replacing all plastics – when feasible – by alternative materials, would mean nearly 3,7 times more materials, which would result in 46% more energy expenditures and a 50% increase in greenhouse gas emissions *. Light, shock proof, hygienic and overall reusable and recyclable, plastic drinking bottles are the most sustainable choice to carry water when doing sports. Once they’ve served their lives as products, plastics are still highly valuable resources and should not simply be thrown away (See why HERE). They can either be reused or recycled into new products or chemical raw materials. When this is not feasible or sustainable, they can be recovered in the form of heat or electricity, as a substitute to virgin fuels. To make the most of plastic waste as a resource and avoid plastics pollution, it is crucial that no plastic waste ends up in the environment. As much as 80% of worldwide plastics marine debris come from land. There will never be any better prevention of marine litter than to stop littering and to properly collect and recover plastic waste. Like any other kind of waste, end-of-life plastics first belong to the bin where they can start a new life. 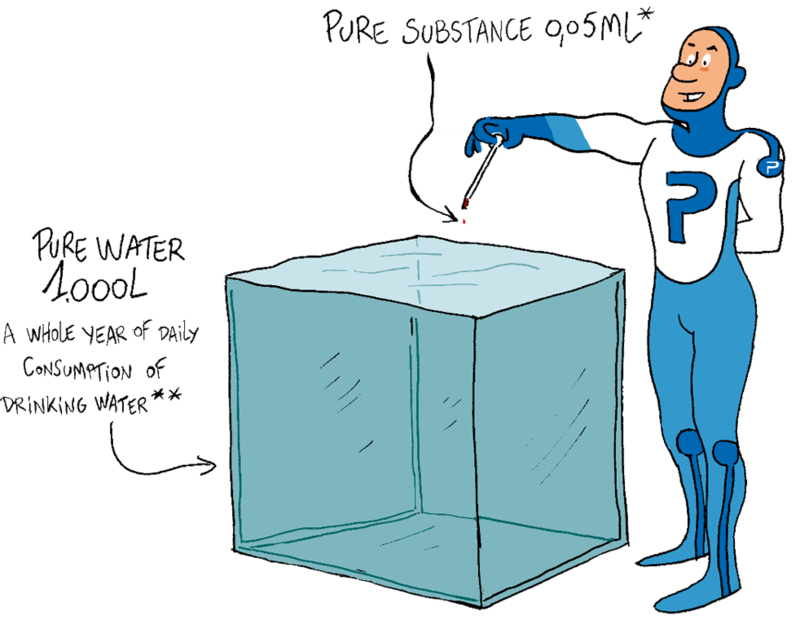 Furthermore, polyethylene melts around 110°C, therefore its recycling into reusable pellets is more energy-efficient than the recycling of aluminium or glass. As secondary materials, or alternative energy feedstocks, plastics have a major role to play in the circular economy – especially when considering the low energy impact of their recycling when compared to other materials. 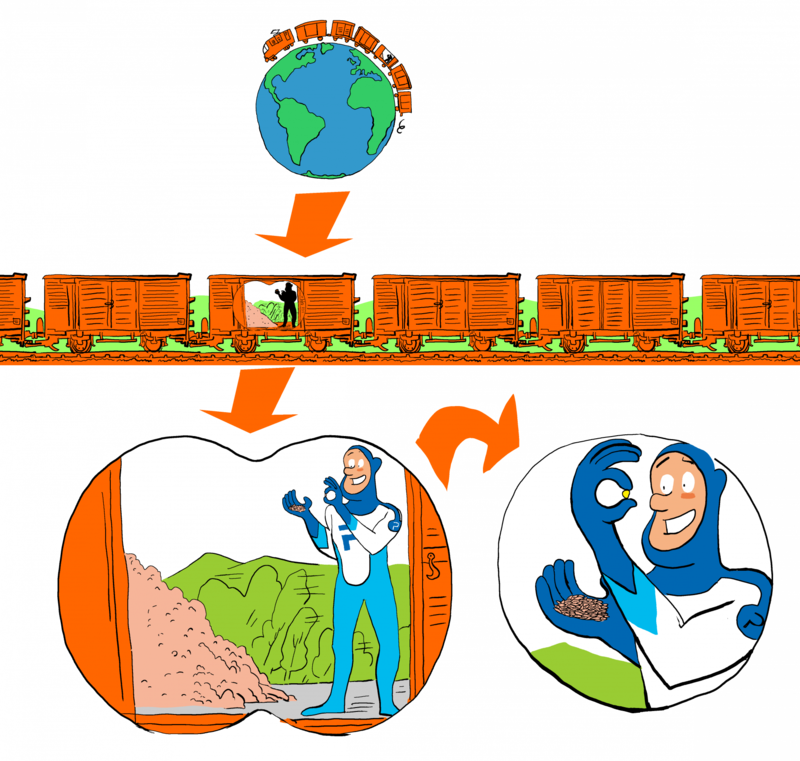 However, to improve the circularity of plastics, it is essential to make sure that more plastic waste is recovered and doesn’t end up in landfills. Today, in Europe*, over 30% of plastics are recycled but 27% of plastic waste are still landfilled while more than 40% are energy recovered. Packaging is the best performing sector with nearly 41% of recycling and only slightly more than 20% of landfilling. In early 2017, plastic raw materials producers committed to reach 60% of plastic packaging being recycled by 2030 and to achieve 100% recovery of all end-of-life plastics by 2040**.